Rush-hour traffic is a headache, and driving to and from work each day can get expensive. A surprising new analysis finds that in some U.S. cities you could use Uber for your commute and even save money in the process. NerdWallet examined data from a variety of sources to compare the cost of commuting each week via ridesharing service Uber vs. a personal vehicle in the 20 largest U.S. metropolitan areas by population, to see if owning a vehicle for work is cost-effective. Although this analysis examined only two commute options, in some metro areas commuters could slash their costs by riding a bus or train, so it can pay to look at the full range of choices. Using typical commute distances for each metro area, we gathered Uber rates for the morning and afternoon rush hours, choosing the carpool UberPool where available or UberX, the private car option, and compared that cost with commuting via personal vehicle and its costs: gasoline, parking, car insurance and vehicle wear and tear. For the data details and full methodology, click here. To skip ahead to the full data, click here. In only one of the eight metros, the Detroit area, the less-expensive UberPool wasn’t available as a commuting option when rate estimates were gathered Feb. 13-17, 2017. How much you could save when opting for the more economical commute in our analysis — whether using Uber or driving yourself — depends on where you live. The amount could be enough to produce a significant weekly savings or to buy an extra cup of coffee. San Francisco-Oakland-Hayward, CA: $83.16 saved. New York-Newark-Jersey City, NY-NJ: $75.75 saved. Dallas-Fort Worth-Arlington, TX: $115.96 saved. St. Louis, MO-IL: $107.87 saved. Detroit-Warren-Dearborn, MI: $5.77 saved by using Uber. Denver-Aurora-Lakewood, CO: $12.38 saved when driving a personal vehicle. San Diego-Carlsbad, CA: $16.20 saved by using Uber. Of all driving-related costs analyzed, gas had the smallest impact on bank accounts in nearly all metro areas. This is due to a combination of relatively low gas prices and short commute distances. For example, the data we used measured the typical commute in New York as the shortest of the metro areas at 7.7 miles, and here gas made up the smallest percentage of commute costs. The Dallas metro area was the only exception to this trend, where parking represented the smallest percentage of all commute costs. The cheapest option in these 20 metro areas is clear, according to the analysis of the data. However, keep in mind that with the UberPool option, the time you spend commuting may increase as other passengers are dropped off or picked up. Although our analysis found the cheapest option to get to and from work each week, there are factors that could sway commuters to take a more expensive route. For some, the wake-up time spent cruising by yourself, or conversely, the peace of mind of not being behind the wheel, can be priceless. Elizabeth Renter is a staff writer at NerdWallet, a personal finance website. Email: elizabeth@nerdwallet.com. Twitter: @ElizabethRenter. Diamond Richardson is a data analyst at NerdWallet. Email: drichardson@nerdwallet.com. The typical commute distance for all metro areas except Boston are from a 2015 Brookings Institution analysis of 2011 Longitudinal Employer-Household Dynamics data. Average commute distance in the Boston metro area is from the Boston Metropolitan Area Planning Council’s analysis of 2006 – 2010 Census Transportation Planning Products. Origination address. We selected a residential address within one mile of that metro’s typical commute distance and within two miles of an elementary school. Destination address. We selected city hall in the most populous city in each metro area. 2016 average annual gas price by metro area from Oil Price Information Service (OPIS). Miles per gallon for a 2013 Toyota Camry 2.5L, 4-cylinder 6-speed automatic from fueleconomy.gov. The cost of maintenance, repairs, taxes, fees and financing is from Edmunds True Cost to Own calculator. We used costs under “year 4” of ownership for a 2013 Toyota Camry, 2.5L, 4-cylinder 6-speed automatic, mapped to the ZIP code for each metro area’s origination address. 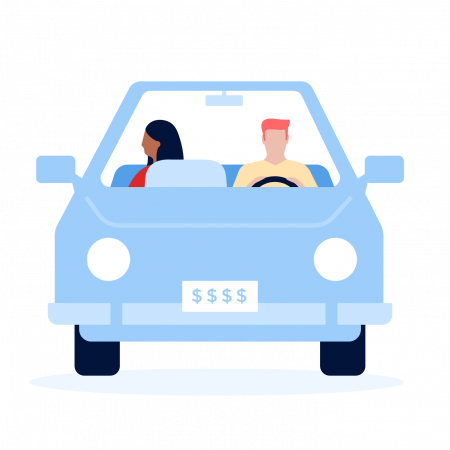 Insurance rates from a sampling of ZIP codes in each metro area were taken from data in NerdWallet’s car insurance comparison tool. These rates represent annual premiums for 30-year-old single male and female drivers insuring a 2013 Toyota Camry. All drivers were quoted liability limits of 100/300/100 and a comprehensive and collision deductible of $1,000. All drivers were quoted 25/50 uninsured motorist coverage, unless there were higher requirements for that state, in which case those coverage amounts were used. To find the average rates for each state, we averaged the rates for each carrier, selected the three cheapest carriers and averaged those. To determine the cost of parking, we collected garage rates from parkme.com, a real-time parking data provider. We selected the three parking lots closest to the destination address in each city that offered monthly parking rates and averaged those rates for an average cost of parking. Uber data was used in this analysis because the service is available in all 20 of the country’s most populous metro areas as determined by U.S. Census data. We entered the starting and ending addresses into the Uber app on Feb. 13-17, 2017. We collected estimated fares from 7:45 a.m. to 8 a.m. and from 5 p.m. to 5:15 p.m. local time in each time zone. Some of these fares fell into the surge pricing category when rides cost more during times of higher demand. If UberPool was available, where riders can share an Uber, we selected that, assuming drivers interested in the cheapest commute would choose the cheapest Uber option. If it wasn’t available, we selected UberX, or the least expensive private Uber choice.